Q: According to reports, yesterday, some people from the British side said that the Belt and Road Initiative, if well implemented, could contribute to global growth, and it is vital that the Belt and Road initiative meets international standards. What is your response? A: The Belt and Road Initiative, as a platform for international cooperation, functions in a mutually beneficial, open, inclusive and transparent way. When we advance the Belt and Road Initiative, we follow the principle of extensive consultation, joint contribution and shared benefits, and comply with the law of the market and international rules, because we want the Belt and Road Initiative to produce high-quality and sustainable results. Just think about it. If the Belt and Road Initiative did not deliver on what we have just talked about, then how could this initiative achieve so much progress with flying colors. You all remember that last May, China successfully held the first Belt and Road Forum for International Cooperation in Beijing, which was attended by the senior representatives from more than 140 countries and heads of over 80 international organizations. That forum led to more than 270 outcomes as well as the international consensus on jointly advancing the Belt and Road Initiative. It has not been long since China put forward the Belt and Road Initiative, but this initiative has already been echoed and endorsed by more than 100 countries worldwide. Now it has become the largest and most welcomed platform for international cooperation in the world. These facts and numbers do mean something. It is fair to say that the Belt and Road Initiative corresponds with the trend of the times, conforms to the law of development, and serves the interests of all, and its future boasts vast potential and bright prospects. Going forward, we will continue with our efforts to further advance the Belt and Road Initiative along with other parties so as to create more opportunities for and make greater contributions to the development of all countries and the global economic growth. Q: The US Treasury on January 30 published a "Kremlin report" which includes a listing of almost all Russian leaders and famous businessmen, to a total number of more than 200 people. The report makes it clear that the US might impose economic sanctions on those countries cooperating with Russia. In light of the close military cooperation between China and Russia, how will this report affect relevant Russia-China cooperation? A: China consistently opposes the willful use or threat of use of unilateral sanctions in international relations. We also note that the so-called report issued by the US Treasury says that it is not a sanctions list and it does not mean restriction of dealings with listed persons by either US or other persons. I want to stress that both Russia and the US are major countries and UN Security Council permanent members, commanding great influence and shouldering important responsibility for world peace and security. We hope that on the basis of equality and mutual respect, the two sides could properly resolve their differences through friendly consultations. China-Russia relations are mature and steady, immune to the volatile external landscape. We believe that with concerted efforts, China-Russia relations will maintain growth at a high standard, and bilateral practical cooperation in various fields, including the military field, will proceed as usual. We would like to work with Russia to realize the development and rejuvenation of our respective countries and contribute to regional and global peace and stability. Q: In US President Trump's State of the Union address delivered a few hours ago, he said that rivals like China and Russia are challenging our interests, economy, and values. What is your comment? A: China and the United States share a wide range of common interests, and they are important ones. We do have our differences, but our common interests far outweigh our differences. The past and present has shown that cooperation is the only right choice for China and the US and a better future can only be realized by promoting win-win relations. We hope that the US can cast away such outdated notions as the Cold-War mentality and zero-sum game and view China and China-US relations in a correct way. It is important for the two sides to work on the basis of mutual respect, focus on cooperation and manage differences so as to ensure the sound and steady development of China-US relations. Follow-up: In his address, President Trump talked about the threat posed by the DPRK and imposing sanctions on the dictatorships in Cuba and other countries. He also said that the US must rebuild its nuclear arsenal, hopefully never having to use it, but making it so strong and powerful that it will deter any acts of aggression. What is your response to all that? A: China's position on the relevant issues mentioned by you is consistent and clear-cut. As regards the Korean Peninsula issue, we have noted that now the situation on the Korean Peninsula has shown some signs of abatement, which is a hard-won result thanks to the concerted efforts of all relevant parties and shall be cherished even more. We hope that all relevant parties can exercise restraint and whatever they say or do shall contribute to continuously easing the situation on the Peninsula. 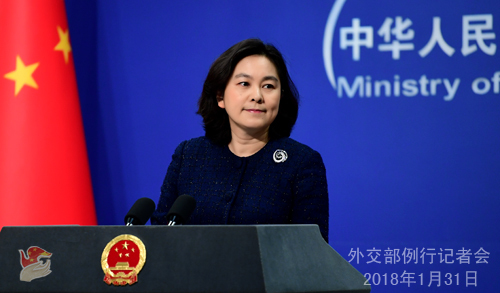 Regarding the issue of sanctions, I have just said that China always opposes the imposition of unilateral sanctions by any country on others in accordance with its own domestic laws. We hope that relevant issues could be properly resolved through equal-footed dialogue on the basis of mutual respect. You also mentioned the issue about the US aspiring to rebuild its nuclear arsenal. We believe in and advocate complete prohibition and thorough destruction of nuclear weapons. The country with the largest nuclear arsenal has a special responsibility when it comes to nuclear disarmament and shall lead by example in that regard and create conditions for the realization of complete and thorough nuclear disarmament. Q: The Australian reported that one of the most disastrously-implemented aid projects in Vanuatu is being delivered by the Australian government, with the project far behind schedule, over-budget spending and poor quality. What is your comment? A: I have noted the report you mentioned. The people and government of the recipient country is in the best position to say which countries provide the most effective assistance. The international community has an eye for it. I want to stress that regardless of how other countries' assistance programs may unfold, we will always offer assistance to the Pacific Islands countries to the best of our capacity and with no political strings attached and sincerely help them realize economic and social development, on the basis of fully respecting the will of the governments and peoples of the Pacific Islands countries and taking into full consideration their development needs. Q: It is reported that the catalogs distributed at a Japanese-brand Muji store in China's Chongqing Municipality contain faulty maps. The National Administration of Surveying, Mapping and Geoinformation of China already addressed this matter. The Japanese side made protests this morning. Do you have a comment? A: I have no idea what the protests are, since I haven't seen relevant information. I did note that the National Administration of Surveying, Mapping and Geoinformation of China already issued a notice, ordering the company involved to seal and scrap the faulty maps and take appropriate measures to prevent similar practices. I want to stress that China welcomes foreign businesses' investment and operation in China, but all of them shall respect China's sovereignty and territorial integrity and abide by China's laws. Q: British Prime Minister Theresa May kicks off her visit to China today and she will hold talks with Premier Li Keqiang. What are China's expectations for the talks? When will President Xi Jinping meet with Prime Minister Theresa May? A: I have already talked about the relevant arrangements and China's expectations for the visit. With regard to Prime Minister Theresa May's schedule, you are correct in saying that she will hold talks with Premier Li Keqiang. In fact, this afternoon, Premier Li Keqiang will hold a welcoming ceremony for Prime Minister Theresa May and then hold talks with her, followed by a joint meeting with the press. After that, they will together meet the representatives of the China-UK Entrepreneurs Committee. During Prime Minister Theresa May's stay in China, President Xi Jinping will meet with her, and so will Chairman Zhang Dejiang of the NPC Standing Committee. As for China's expectations for this visit, we have said before that the Chinese side attaches great importance to China-UK relations as well as to Prime Minister Theresa May's visit this time. As the UK is committed to advancing the "Golden Era" for China-UK relations, we hope that through Prime Minister Theresa May's visit and an in-depth exchange of views, China and the UK could further enhance mutual trust, expand pragmatic cooperation in various areas, strengthen communication and coordination on major international and regional issues and promote the steady development of the "Golden Era" for China-UK relations in the new era. Q: India's former ambassador to China Vijay Keshav Gokhale took charge as India's Foreign Secretary, succeeding S. Jaishankar. Reports say that Mr. Gokhale, as a Chinese expert, will help China-India relations overcome disputes and strengthen cooperation. What is your comment on his appointment? A: We have noted relevant reports. We congratulate Mr. Gokhale on officially assuming the office as Foreign Secretary of India. Ministries of Foreign Affairs of the two sides have been making active efforts to advance bilateral ties in accordance with the consensus reached between the two leaders. We hope that such sound and cooperative relations could be sustained and reinforced. 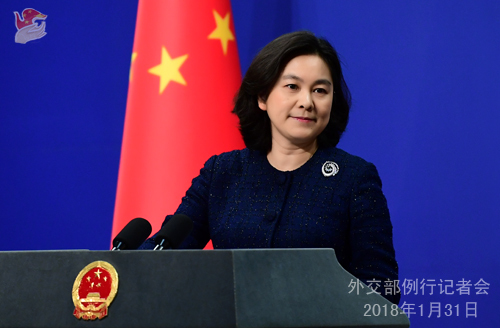 Following the guidance of the five principles of peaceful co-existence which are jointly championed by the two sides, China stands ready to work with India to enhance political mutual trust, promote mutually beneficial cooperation, properly manage differences, and move forward China-India relations along the right track.